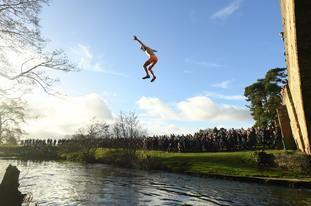 People across the UK and Europe have taken the plunge for a bracing new year swim. Swimmers from Scarborough to Scheveningen (Holland) took to the waters as part of a New Year fundraising campaign which has become a tradition in many parts of the world. There were colourful scenes in Scotland as revelers, many of whom in fancy dress, flocked to the shores of South Queensferry for a swim in the chilly waters of the Firth of Forth for an event known as the Loony Dook. 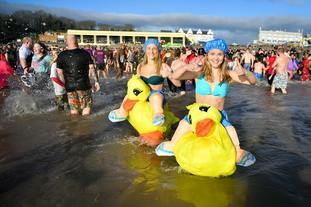 Thousands also turned out at several locations in England, such as Lyme Regis and in Wales, where scores of people came out for the Barry Island New Year's Day swim in the Vale of Glamorgan, Wales. In the seaside district of Scheveningen, Holland, around 10,000 people jumped into the sea as part of a tradition thought to date back to the 1960s. More than 60 thousand people were expected to take part in similar events on 24 locations across the Netherlands. Swimmersin Germany, many wearing fancy dress hats and costumes, took a plunge in a lake on the outskirts of Berlin in temperatures of just 2 degrees Celsius. In Rome the tradition is slightly different, instead four divers take turns to jump off the 18 metre high Cavour Bridge over Rome's Tiber River. This year four men took part in the annual tradition which dates back to 1946; Simone Carabella, Valter Schirra, Marco Fois and the crowd's favourite diver, the veteran 66-year-old Maurizio Palmulli. The annual Scarborough Lions New Year's Day Dip, which encourages people to arrive at the beach in fancy dress for a dip in the North Sea, also took place. Scarborough Lions Treasurer Roy Chambers said: "Everybody was good humoured. The crowds were in excess of 3,000 spectators. It is nice to see eveone on the first of January with a smile on their face and also making contribution."